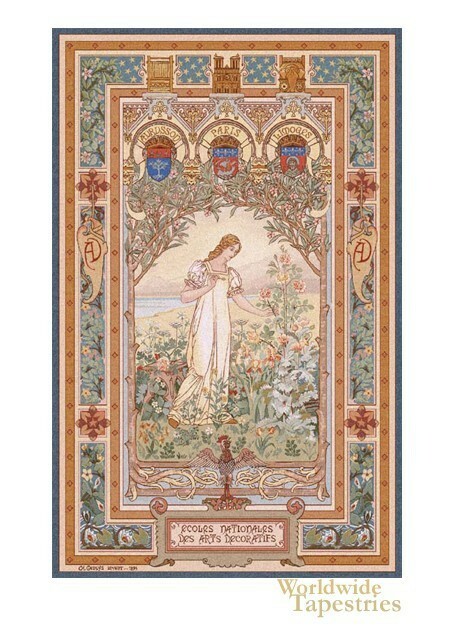 This tapestry depicts Aurore or the personification of "Dawn" and new beginnings, in her garden at sunrise. This work is based on an original created in 1884 by Charles-Louis Genuys, the painter and architect, and professor at the Art School of Limoges. The three French schools of decorative art at that time, Paris, Aubusson and Limoges and named above the three shields. The words "Ecoles Nationales des Arts Decoratifs" at the base of the tapestry means National Schools of Decorative Arts. In this work, we see Aurore plucking a wild rose from a garden at sunrise to symbolise anew beginning. This tapestry is backed with a lining and comes complete with a tunnel for easy hanging. Dimensions: W 26" x H 44"
Dimensions: W 55" x H 87"